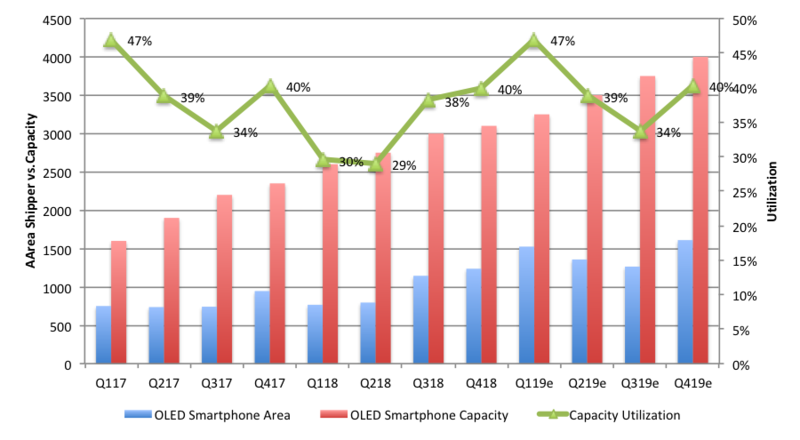 DSCC in its Quarterly OLED Supply/Demand and Capital Spending Report. 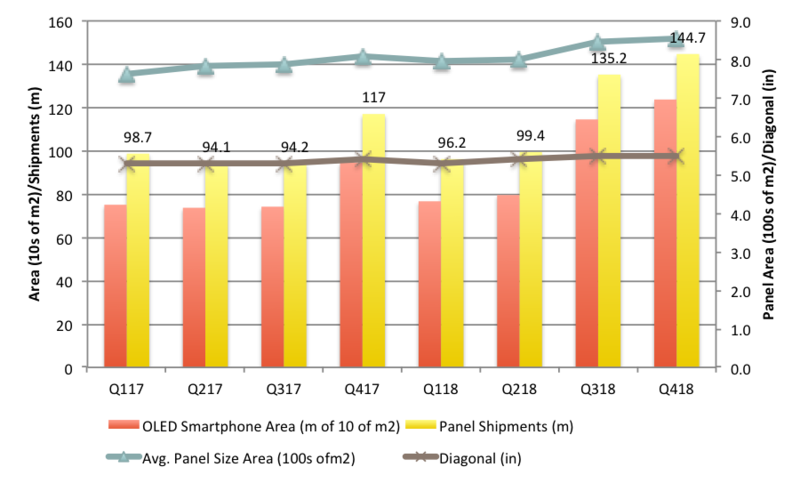 showed that overall small/medium OLED capacity rose from 30% in Q118 to 38% in Q318 and is expected to rise to 47% in Q119 before falling to 40% in Q419. The use of the term utilization is somewhat different than normal, in that it includes the fab yields, since it is based on shipped area in m2, divided by the capacity in m2. The capacity includes the unused Samsung A4 fab and the underutilized Chinese fabs from BOE, Tianma, Truly, EverDisplay and Royole. As we reported previously, Samsung’s utilization in Q3 and Q4 is expected to be over 90%, excluding A4. Note that the average diagonal is calculated with a 16:9 panel design and the average diagonal seems a bit low, which could result from a difference between the way we calculate the diagonal and the way DSCC calculates the area. However, the main assessment is that Samsung’s utilization without A4 should grow substantially as we predicted in a previous Musing and the Chinese will have to up their game in order to increase overall utilization.